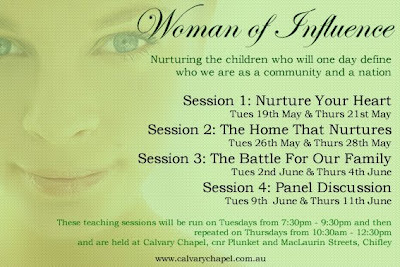 Calvary Chapel Women's Ministries are running a 4 part teaching block on being an influential woman. If you plan on one day having children, have children of your own (babies, toddlers, school aged or teenagers), or are a grandmother, or even just have something to do with children - then this is for you! During these lessons, you will hear about: Breaking the cycle of dysfunction; being intentional about the legacy you want to leave; how to train your child spiritually, emotionally and socially; how to build a wall of protection around your children; and much much more!